Nikki Christo greets me enthusiastically whenever I pop into Blunch, the tiny South End sandwich cafe she owns on the corner of Harrison Avenue and East Springfield Street. We chitchat about my latest stories, her upcoming wedding, our dogs, neighbors we both know from when I lived around the block, and — the biggie — the shop’s upcoming appearance on the Food Network’s “Diners, Drive-Ins & Dives.” I’m ensconced at my usual stool, awaiting the “whim,” Blunch code for the daily special. Today it’s a pressed baguette filled with a souffle-style egg, hunks of earthy portobello, and a creamy smear of feta cheese and lemon aioli. Getting a spot at Blunch, never mind my favorite stool, is about to become very difficult. If history is any indication, shortly after the Blunch episode airs, long after Guy Fieri has pulled away in his signature red ’68 Chevy Camaro, the line at Blunch is going to be out the door. Christo has been warned by the Food Network that she’ll need to hire extra staff to handle the crowds. “I’m nervous,” she confides. At the cafe, the tangy smell of oven-roasted tomatoes — used in several sandwiches — usually lingers. White walls are dotted with framed Bleu des Basques and Fromagerie de la Tournette cheese wrappers. Diners look out onto East Springfield from one of 12 stools at a white tile counter that runs along the front of the shop. When it’s warm, a few more sit outside under umbrellas. 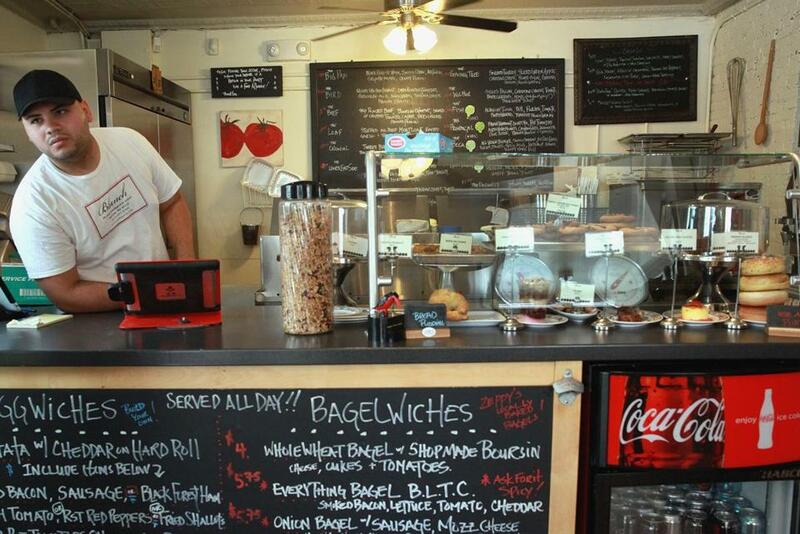 The menu — written on blackboards — is divided into pressed items (sandwiches like The Piglet with smoked ham, bacon, maple aioli, and tomatoes on multigrain bread, pressed and melty), “eggwiches” (like shop-roasted tomatoes with eggs on a hard roll), salads, and bagels and bagelwiches. There’s also a selection of sweets and coffee. 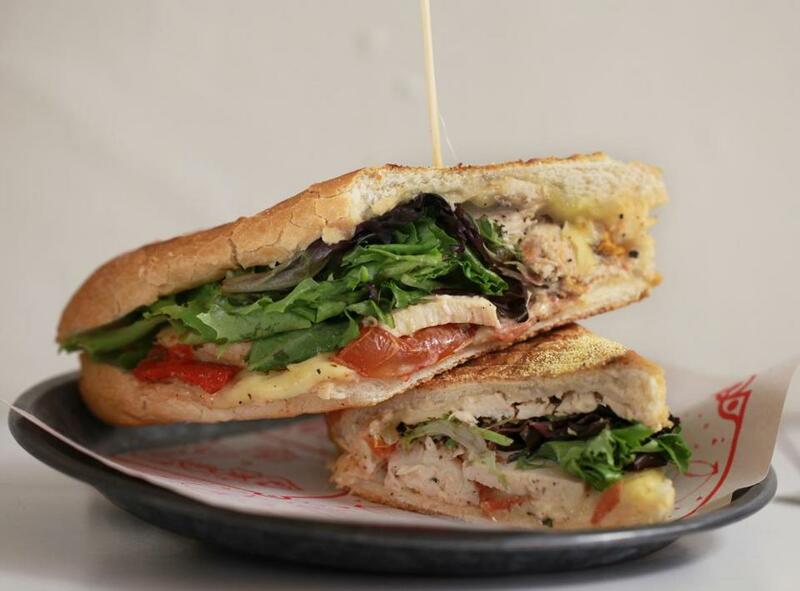 For Fieri, Christo made two popular pressed sandwiches, The Provencal, with goat cheese and an unusual nut pesto, and The Bird, roast chicken with artichoke aioli. The Bird panini at Blunch. My favorite items include granola, which I ordered on the first day Blunch opened (I happened to be the first customer), fresh raspberry muffins studded with chocolate chips, warm squares of crumb cake, and a bagelwich with juicy tomatoes and crisp cucumbers held together by a silky Boursin-like herb cheese Christo makes. For lunch, it’s almost always The Lower East Side, a roast beef sandwich with spicy horseradish slaw. When my family visits, meals at Blunch are obligatory. Christo and my mom talk cookies. After Friday, will Blunch’s regulars ever get in the door? Life immediately after the Food Network will be hectic for sure, says Jim Iannuzzi, co-owner of Italian Express Pizzeria, an East Boston restaurant that appeared on “Diners, Drive-Ins & Dives” in 2012. “The first thing they asked us was, ‘Are you sure you want to do this because it’s going to change your business?’ ” Iannuzzi says. “Pretty much lines out the door and it started as early as the next day.” People came from England, Australia, China, some pulling up in cabs straight from the airport. The crowds, which even now keep the restaurant hopping, surge whenever the Italian Express Pizzeria episode re-airs. She says she keeps reliving moments in her head: watching as Fieri rolled from the nearby Mike’s City Diner, one of the first Boston restaurants on his show, to Blunch for the opening scene; Fieri propped up against Blunch’s drink cooler as he checks his cellphone; the spray painting of the show’s orange and green “Guy ate here” graffito on Blunch’s white walls, just above a collage made from food magazine cutouts. The sandwiches Christo made for “Diners” begin with a crusty baguette from Quinzani’s Bakery down the street. The Provencal starts with a spread of Vermont goat cheese. A cashew pesto prepared in Blunch’s minuscule side pantry — barely big enough for two — is next, then a Kalamata olive puree, and the house-roasted tomatoes. Those red orbs have been seasoned with balsamic vinaigrette, Italian seasoning, and other spices, and roasted for 45 minutes. Slices of fresh tomato and artichoke hearts are layered on before the sandwich is crisped in the press. Greens are added just before Christo slices the sandwich and arranges it on a plate. 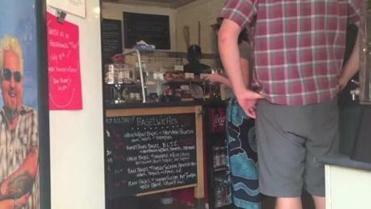 Sandwich maker Andres Oronda in the small South End cafe Blunch. The Bird has fewer layers. First comes a smear of artichoke aoili, then mozzarella, roasted tomatoes, and a generous mound of white-meat roast chicken. Into the press again, add the greens, slice, and arrange. Despite the pressure, Christo can’t contain her giddiness. This time, she’ll be sitting in her living room listening to that familiar voice on television — and then her own. 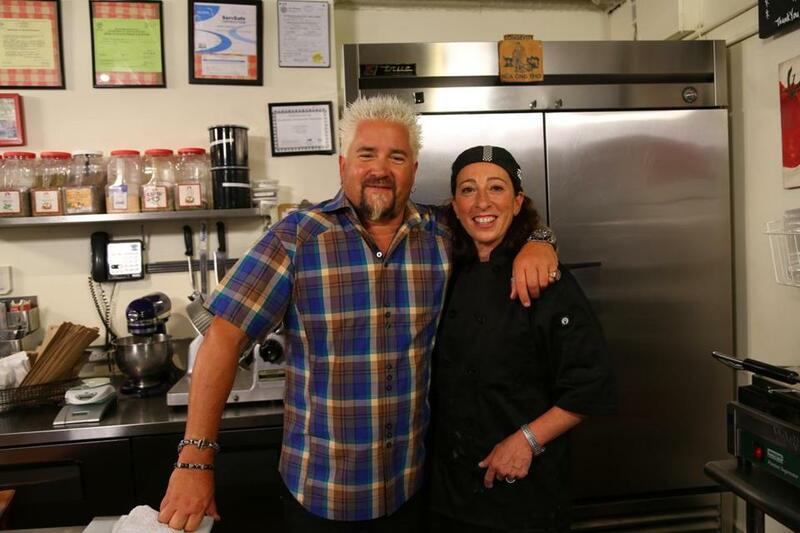 Guy Fieri, host of the Food Network’s “Diners, Drive-Ins & Dives,” and Nikki Christo, owner of Blunch, a South End sandwich cafe being featured on the show.